Oh, look, here's a cute little orange alien! He's so round and glowing and cuddly, with fat, wobbly antennae and such. Look at him. He's such a darling, isn't he? Wait, he just disintegrated some scientists. Well... they probably deserved it. Scientists often do. What's he doing now? Why is that man bloating? He... he just blew up, entrails flying, blood gushing. Oh my. This is not right. 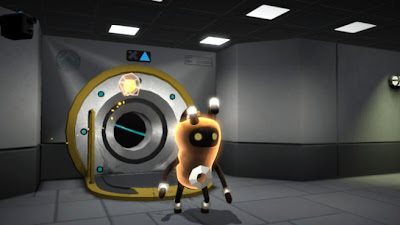 Warp is a puzzle action game developed by Trapdoor, in which you take on the role of Zero, the above-mentioned alien. After getting abducted by the nefarious Commander, Zero is trapped in an underwater facility. He escapes with ease, but decides that vengeance must be his, and begins to blow everyone up in a most gruesome way. The game is already out on Xbox, but we won't be seeing it on the PC until March 13th. Because that's just how business works. You wouldn't understand.